The aircraft gantry has been designed to fit the triple stile TAL ladders and to be operated whilst deployed from a vehicle platform. The swivel mechanism provides flexibility of use and will adapt to the required angle needed for deployment. A set of etended arms are also available for the Boeing 747 for added stability (not shown). Although initially designed for aircraft use, the front nosebar can be removed to reveal wheels to deploy the gantry against a wall, and to allow ease of extension. 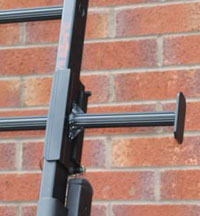 The Side Step has been developed as a universal item that will fit both sides of any current FDS wide type ladder. The step is designed to aid movement of personnel up and down the ladder. The Velcro Ladder Strap provides a quick and easy means of securing the sliding section of a multi-level ladder to its base section to prevent the ladder sections from separating. 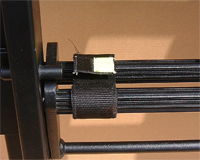 Velcro straps can also be fitted to the top rung of the base section to reduce ladder noise. Supplied as standard with all FDS extension ladders. The Ladder Cushion Rest is a laminated foam block which fits over the top stile section of FDS Ladders. The Cushion Rest protects the ladder top, increases grip, reduces noise and protects target structures such as commercial aircraft. Stand-off and Stabliliser Platforms are fitted to the top of FDS ladders to ease MOE type operations. 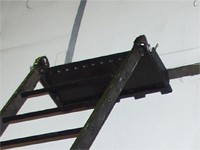 The platforms are secured to the top of the ladder with a spring type pin. Stabiliser platforms are designed for vehicle based ladders and provide a degree of stand-off. Foot platforms are designed to provide a large working platform on a ladder for extended periods of use. A heavy duty spring loaded spike for use in sand or mud conditions. It can be specified for all ladders, except vehicle based ladders. FDS manufacture a range of detent and pip pins that are suitable for a wide variety of uses. 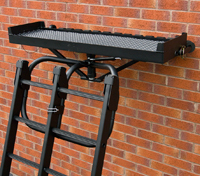 The initial design was to support the ladder and vehicle platform product range. For more information on the pins click here.